Swing Beds are basically giant porch swings! 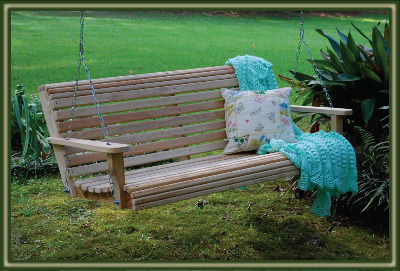 A Cypress Moon Porch Swing Bed is over 6 feet in width and handmade from Louisiana cypress! Perfect for indoor or outdoor use, the dimensions of The Swing Bed will accommodate a twin mattress. Interior Designers love to decorate them with just pillows and blankets, but whatever you use it for, our Wooden Swing Beds will be a WHOLE LOT of fun! In today’s fast-paced society, we have a tendency to get so caught up in everything around us that we often times end up missing the best things in life. Here at Cypress Moon, we truly believe in the therapeutic benefits of our porch swings and that's why we offer a wide variety to choose from! We take great pride in being an American Furniture Company and hope that the quality of our craftsmanship proves it! The Cypress Moon Family looks forward to the opportunity of offering you these fine products and we thank you for visiting us! Big enough to take a nap on! 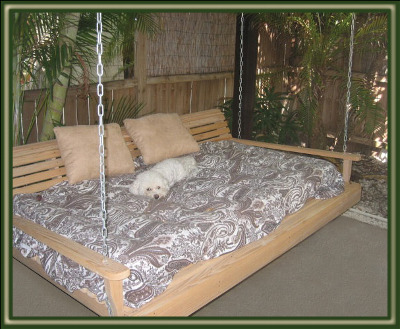 Our gigantic Swing Bed is perfect for indoor or outdoor use and will accommodate a twin mattress! Got your own design ideas? We can also custom design a swing bed that fits your personality & needs! Cypress Moon is a family-owned & operated business that has been building wooden furniture in Louisiana for 23 years! Our famous Porch Swings are available in 7 different models: The Classic Porch Swing, Rollback Porch Swing, Console Porch Swing, Decorative Porch Swing, Engraved Porch Swing, & Swing Chair. Snuggie - The Snuggie Shop is the official store for The Snuggie™ Blanket! Regular blankets are OK, but they can slip and slide, plus your hands are trapped inside. We carry all styles, including: Classic Snuggie, Designer Snuggie, Custom Snuggie, College Snuggie, Snuggie for Dogs and Snuggie for Kids! Christian Shirts - SOUL HARVEST sells all original Christian Shirts and Christian Clothing, including: Revelation, Christian Fish, Green Christians, Laminin, Vintage Retro and Cowboy Church Shirts! Funny Shirts - The Funny Farms sells crazy. Check out our funny t-shirts, funny pictures and funny videos!